All travelers should carry one, without exception. 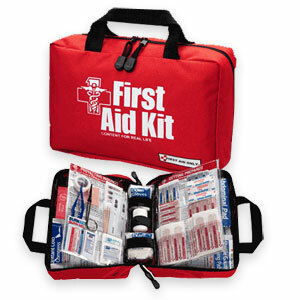 A first-aid kit can be tailored to each trip, and varies in size and contents depending on a number of factors. Professional travel companies have well-established routines to follow, should they need to help with more serious events. But when trekking into the heartlands of any country, hikers and independent travelers should come prepared. When packing your kit remember: A personal first-aid kit contains all the things you might need to look after yourself, not the group. Ideally, everyone carries an identical kit, and when needed uses it on themselves or gets a fellow traveler to help out. In reality, things are different. But even so, there are some generic first-aid supplies that should always be part of your pack regardless of destination. The following list was compiled with the help of Mr Stuart Halliday, a Medic Safety Advisor, and former British Army Combat Medical Technician. Personal prescription meds – Ensure that before you leave you have enough to last your stay, and at least a few days extra in case flights are delayed. If you suffer from hay fever, check the season – you may not need your medication at home, but could be sniffling and sneezing on arrival. Dressings and cleaning solutions – Cuts and grazes are inevitable, so take waterproof Band-Aids and some form of larger, more absorbent dressing. Gauze pads are good for cleaning and dressing small wounds, and with some surgical tape, they can be used instead of off-the-shelf dressings. To clean cuts use soap and water, but pack a few antiseptic skin wipes or perhaps some saline solution. Iodine is a further option as it helps sterilise wounds. Basic analgesia (painkillers) – Don’t be packing Morphine! It’s not necessary. You should take basic pain relief, such as Tylenol or Advil, but leave carrying the strongest medication to the medics – otherwise you may find yourselves answering questions at customs. Blister kit – Blisters are par for the course. Hopefully, you know your feet and can look after them properly, even so it is advised to carry commercial ‘blister kits’, such as Compeed (branded under Band-Aid) or make up your own. A roll of sports tape (Zinc Oxide) and small sterile pads is all you need. Preparing your feet is also vital; try wearing two pairs of socks; make sure your boots fit, are broken in, and you have taped over areas that commonly blister. And pack some foot talc, perhaps the medicated variety, which helps combat athlete’s foot. Burn dressings – these are sterile, pre-packed dressings designed to help draw heat from smaller burns. Ever burnt yourself on a camping stove you thought had cooled? It’s easily done. Creams and lotions – Sunblock we will deal with separately, but it goes without saying they are essential. The two creams I would recommend are a simple anti-septic cream and an anti-fungal cream (also good for athlete’s foot). Tweezers, needles, scissors and clippers: Again, take care with packing anything that may excite over-eager customs officials. Tweezers always prove useful and a couple of sterile needles are great to help drain blisters. Scissors you need to cut dressings and tape. Nail scissors and an emery stick help maintain those tired feed – look after them, and they’ll look after you! Other Essentials: In case of stomach upsets, take Loperamide (Diamode, Imodium, Imotil) and Prochlorperazine (Compazine), as well as a few packets of Dioralyte or similar rehydration powder. There are a number of first-aid travel kits on the market, take a look around. And be sure to check with your doctor if you are already taking medication. Before you leave, you should also inform your adventure travel tour operator of any medical conditions you have. Boundless Journeys is an award-winning small group adventure tour operator, selected as one of the “Best Adventure Travel Companies on Earth” by National Geographic ADVENTURE; and a “World’s Best” tour operator by Travel + Leisure.